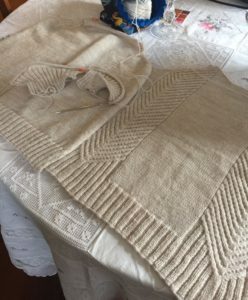 I had a terrific experience with knitters at the Sheep to Shawl Vermont Fall Knitting Retreat, and I have lots to share from that experience, which I will tell you about in the next few days. One thing I especially want to share is that thanks to help from Donna Druchunas and Dom Cotignola, I now have a YouTube video channel with Annetarsia tips! For those of you who need a quick reminder, you can now access them on YouTube. I loved being away, but re-entry has been harsh, with a back-log of work and a desk full of things requiring immediate attention. Sigh. It’s OK. I’ve been working steadily, and 10 days later I am pretty well caught up. My body is still on East Coast time, but I don’t mind going to bed and getting up early. Knitting projects are progressing, and today I’ll catch you up on what is happening. I have 3 projects on the needles right now. Messaline is my easy knitting project. I’ve finished the body pieces, and am working on the sleeves. I might see a movie this weekend- this is great movie knitting. 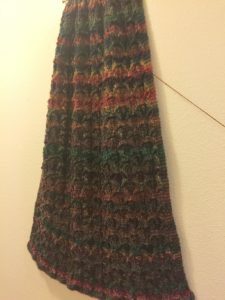 I made the body longer than the pattern stated, and I hope that it is long enough. We will see! Front and back are finished. Working on both sleeves at the same time. The Fanfare Lace Wrap is what I’m working on when I have time to concentrate. The lace is on every row, and although I am about 30% done, I still haven’t been able to memorize the chart. It is fiddly, and I don’t really like knitting in it, but I love the finished shawl so I will persevere. It had better look like the picture when I’m done! Right now it is not inspiring me. But I never underestimate the magic that happens when lace is blocked. I have faith. I’m about a third of the way through. It will be longer and wider when blocked. Right now I feel as if I’m knitting a blanket. The Fancy Feet anklets are my small, carry-around project. No big deal, and I threw a bit of Annetarsia in there just to make it a bit more interesting. 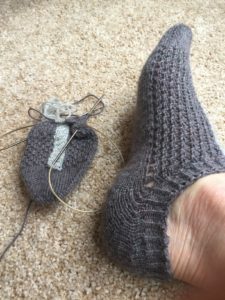 The finished footie is very light-weight and comfortable, and I like the heel very much. 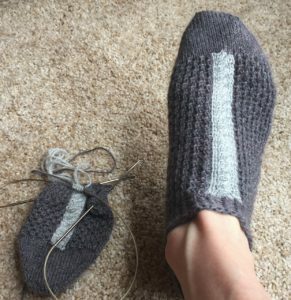 It is a short-row heel, with irregular stitch counts so that the heel hugs very nicely. I like it. I’ve been too busy catching up to do a lot of knitting in odd moments, so this has been sitting in my purse most of the time. But, I’m prepared!!! Footie is cute and comfortable. 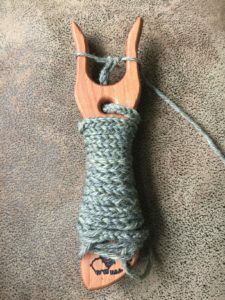 I have also been playing with my new Lucet, which I love. Bill is worried about what I am going to do with all the cord I am producing. This is completely addictive! Happy weekend, everybody. I promise to get some photos from the Vermont trip here, in the next day or two.